As with most of us, B2B buyers are time poor and coupled with the proliferation of content available, it's not surprising they're feeling overwhelmed. It's more important than ever to deliver great quality content targeted at your audience. Influencers are becoming more and more important with B2B buyers wanting to source content from 'trusted' sources. They're also looking for quick ways to consume that content; podcasts and infographics climbing in popularity. 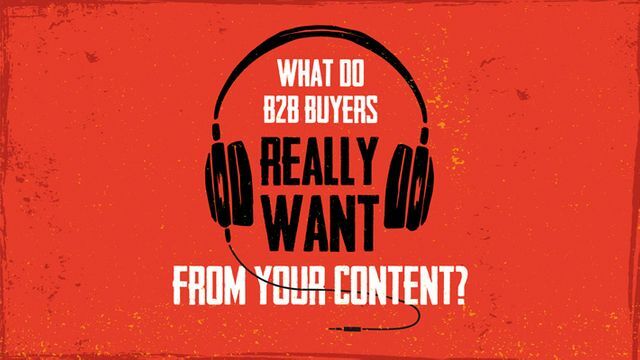 Blog posts however, continue to be the 'go to' for most B2B buyers. In this infographic from Uberflip, 76% of buyers want content backed up with more data and research so make sure that your content strategy is delivering value and not just filling space. This article is a great read along with the Demand Generation report to review when you have more time. In many ways this is a demand generation survey for the ‘Content Shock’ era. It shows that content has more influence over B2B buying decisions than ever, with 49% of buyers saying they rely more on content to guide their decisions than they did a year ago – and 78% consuming three or more pieces of relevant content before talking to a salesperson. However, it also shows that time-poor B2B buyers are feeling overwhelmed by the amount of content out there. In response, they’re adopting definite strategies for deciding which content has value – and which doesn’t.